How Long I used the Product: I used it for over a week straight on badly chapped lips. 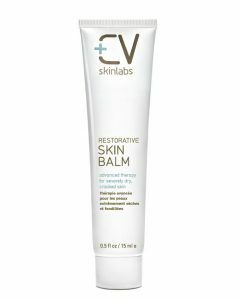 CV Skinlabs Restorative Skin Balm is formulated for severely dry, cracked skin. 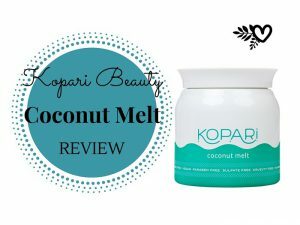 This petroleum free product is rich and thick and is designed to coat the skin and create a soothing barrier to trap in moisture. 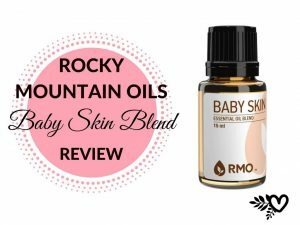 Use it on severely dry, rough and chapped skin including lips, cuticles, eczema, cuts, scrapes, IV areas, abrasions, chaffing, new scars and any other areas needing TLC. Every CV Skinlabs product contains their Tri-Rescue Skin Complex. A blend of turmeric, alpha-bisabolol and reishi mushroom creates a powerful combination of wound-healing, anti-inflammatory, skin-soothing ingredients that facilitate repair and healing of damaged skin, while also having anti-aging properties. Castor Seed Oil – Contains Undecylenic Acid which is useful for treating skin diseases and skin ulcers, due to its germicidal and disinfectant properties. 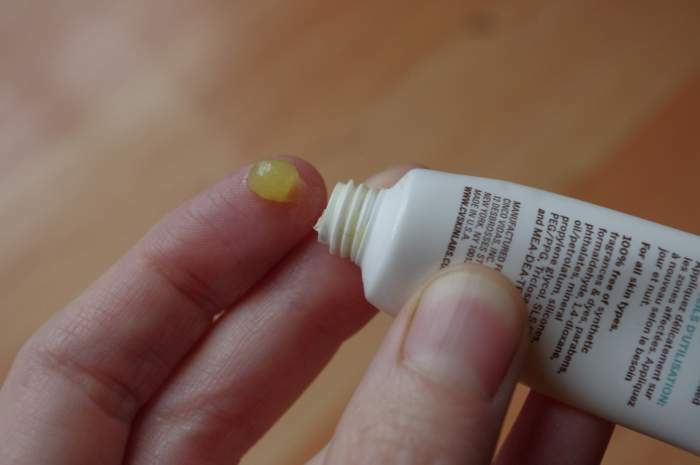 Lanolin – Has a molecular structure that closely resembles human skin lipids. It forms a semi-occlusive breathable barrier, protecting and absorbing at the same time. Once it penetrates the skin, it can hold up to 400 times its own weight in water. It moisturizes the skin from the inside and out. Calendula, Sea Buckthorn Oil, Arnica – Contain plant based antioxidants, fat-soluble vitamins and sesquiterpene lactones (a class of naturally occurring plant terpenoids) that are well known for their immune boosting, skin healing and antiseptic properties. Carnauba and Bee’s Wax – protects the moisture barrier by keeping moisture in your skin. Vitamin E – aids in wound healing. A powerful and proven antioxidant. Triolein – A symmetrical triglyceride derived from glycerol and oleic acid.. Used as a solvent; thickener; viscosity controlling. Caprylic/Capric Triglyceride – Derived from coconut oil and glycerin. Works as an emollient, dispersing agent and solvent. I received a sample of this balm from CV Skinlabs and I have to say, I was not disappointed. This balm is thick and rich and came in very handy when I had a bout of seriously chapped lips. I had gone camping one weekend and ended up with really bad chapped lips. I had been using lip balm to prevent dry lips, but the lip balm I was using had drying ingredients in it (I am looking at you, peppermint). After I got home, it was clear that my lips were damaged. This was the worst case of chapped lips I had ever had. They were dry, cracked, itchy and swollen. I started using CV Skinlabs Skin Balm on them. It was a lip savior. The balm was nice and thick, and stayed on my lips for a long time, meaning I only had to apply about 4 times a day. It took a week for my lips to fully recover. I was happy that I had something that brought immense relief and helped keep my lips moist so they could heal. 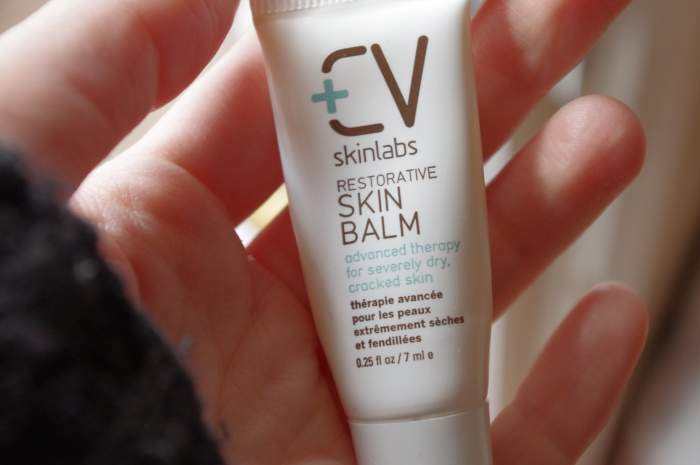 CV Skinlabs Skin Balm kept my lips hydrated and helped soothe the redness and irritation. Now any time I get dry lips, I go straight for my CV Skinlabs Restorative Skin Balm. I have also used it on itchy skin and eczema patches, and it works very well. There is no scent, CV Skinlabs does not use fragrance or essential oils because they can be irritating. The texture is thick, like Vaseline, but without petroleum. When I used it on my lips there was no foul or funny taste. The application is effortless, just squeeze a little out of the tube and apply. 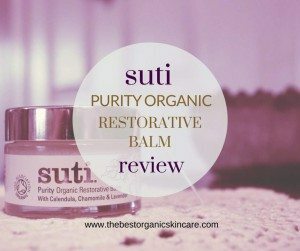 I love this skin balm as a rescue remedy for dry, chapped skin. I would recommend it to anyone who is suffering from damaged skin. I think keeping some of this on hand is a good idea, for those times when you have to deal with dry lips or cuticles. Next time I go camping, I am bringing this product with me, as a preventative to getting chapped lips. Many people are happy with this product. They have found relief for their eczema and dry, itchy skin. They have used it on small cuts, chapped lips, dry hands, and cracked skin.